The Severe Acute Respiratory Syndrome infected over 8,000 people and claimed over 700 lives worldwide. SARS. Some tremble when they hear of the name while others count how lucky they were to escape of contracting the deadly virus. This is a personal story from one of our team members, Ming Han (from Singapore). For the frontline medical staff in the hospitals, fighting SARS has not only been a challenge, but also a fearful experience. When the SARS first surfaced, it was something unknown and new. Among the hectic lifestyle of people, SARS shot out of the blue, invisible, yet life-threatening. "For many school children, SARS might have stood for Sixteen April Return School"
Schools in Singapore closed on the 26th of March 2003 as a precautionary measure against the new virus. The move was aimed at preventing students from contracting SARS in public places and public transport such as shopping malls, educational institutions and buses. It was generally believed that the move would alleviate parents' worries and that if children stay at home, they had a lesser chance of contracting the virus. For many school children, SARS might have stood for Sixteen April Return School, but for many Singaporeans, as noted by Singapore Prime Minister (Mr. Goh Chok Tong), as he said in his 2003 National Day Rally Speech, SARS stood for Singaporeans Are Really Scared. Yes, there is no doubt on this. SARS has virtually affected everyone, from the hawker at the food center to business men. "Students had to disinfect their desks after school everyday using detergent, and teachers had to supervise the disinfection process." In Singapore, when students returned to school after the school closure, they were given a SARS briefing. In many schools nation-wide, students had to disinfect their desks after school everyday using detergent, and teachers had to supervise the disinfection process. Students were also given a digital thermometer, and had to take temperatures twice daily. The temperature taking exercise was usually a solemn one. Those who had a reading temperature above 37.5°C had to retake their temperature. If the temperature was still above the limit, he or she had to go to an air-conditioned room and rest for 15 minutes before retaking his or her temperature again. If the temperature didn't change, the student was either sent home to rest or sent to a doctor. It was also compulsory for students to bring the digital thermometer everyday. After each temperature taking exercise, which usually last about 3 minutes, students had to record temperatures in their logbooks, and had to ask their buddy to sign and verify that the temperature reading was correct. In some schools, SARS humanitarian drives were conducted so that donations can be contributed to the SARS Courage Fund in Singapore. The Courage Fund later raised about 28.6 million dollars. The kind of thermometer shown in this movie was used at schools in Singapore. 4.1.1 Windows Media Movie (used with permission of Health Promotion Board Singapore). In addition, during the closure of schools, schools made use of e-learning portals and information technology to facilitate learning online. Some of these e-learning portals could even allow students to take part in discussions forums, download worksheets and know what topics to study. Besides the use of IT, some schools decided on using the traditional method of post. That is, by mailing worksheets to their students for them to complete. In hawker centers and school canteens, paper plates and plastic spoons and forks were used, instead of the usual plastic plates and metal eating utensils. This was another change citizens had to accept. The temporally replacement of the plastic plates were to prevent people from contracting SARS as it was feared that the coronavirus might still be present on the plate after washing if a SARS infected person had used it. 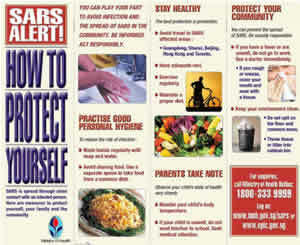 4.1.2 A SARS poster from Singapore. You can also view a bigger version (used with permission of Health Promotion Board Singapore). "As the world celebrated the 100th anniversary of the Wright Brothers' invention of the airplane, we should, perhaps note that air travel has put us at disadvantage too." As the world celebrated the 100th anniversary of the Wright Brothers' invention of the airplane, we should, perhaps note that air travel has put us at disadvantage too. For a start, air travel was a primary cause of the speedy spread of SARS around the globe as people who had contracted SARS flew from one corner of the world to another. That risk, however, had been greatly reduced, when countries imposed stringent measures such as temperatures checks at airports, as well as extensive international cooperation. Prevention is the best medicine to prevent and contain the spread of the dreaded coronavirus. With so little know about the virus, prevention will serve to act as a barrier against SARS and humans. How strong that barrier and how long it will last will depend on our determination for international cooperation and medical research. Finally, here is a quiet tribute to the frontline doctors and nurses who waged the war against SARS. For some, SARS will remain as an open scar, a reminder of the friends and family members they have lost.